Happiness doesn’t have to be a fleeting emotion. Through this workshop, attendees will learn how to reduce their stress and anxiety levels as they become positive forces within their own lives. Fostering creativity, building resilience, and achieving life long goals are just a few of the benefits that can be achieved when happiness is embraced. This nurturing program will help participants find the internal strength that they need to overcome major life challenges. Life is filled with unexpected highs and lows. Learning how to emotionally handle these fluctuations is an important step towards taking back control of your life. During this program, participants will learn how an out-of-the-box approach to mindfulness can bring about positive emotional change. Understand how happiness directly impacts their life on a daily basis. Respond to life’s unexpected curve balls. Increase self-awareness by discovering the impact of conscious choice. Flip the table on challenges by turning them into opportunities. Learn how to bring joy, compassion, contentment, and happiness into a daily routine. Promote the cycle of self-healing by harvesting moments of true happiness. Through film, music, story telling, and movement participants will rediscover what it means to live their lives from a place of contentment. Fears, social anxiety, and stress can slip away when obstacles are transformed into positive opportunities. Rediscover what it means to say “yes” to joy and “goodbye” to negative emotions by creating a stable environment that focuses on personal happiness. 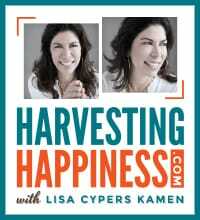 Lisa Cypers Kamen, MA is an internationally recognized author, speaker, filmmaker, talk show host, and applied positive psychology coach. She has spent her life dedicated to helping people enhance their quality of life by cultivating the greater good through happiness. Her work and approach to achieving a positive state has been instrumental in helping individuals and their families recover from addiction, trauma, and moments of life-crisis. A two-time TEDx speaker, Lisa brings the experience, compassion, and leadership needed to help program participants take the all-important first steps towards harvesting happiness on a daily basis.